← Memories of St. Peter’s Church, East the Water. It’s surprising how they add up once you set out to count the bridges.! The oldest of course were the pack-horse bridges dating from around the 12th century of which there were three, Bideford, Rothern and Taddiport. All these show clear evidence of various widening works over the centuries to enable initially carts and carriages and eventually motor vehicles to cross, although still supported on the original stone piers except in the case of Bideford Long Bridge where it is believed that an original timber structure is embedded within the more recent, 13th century, masonry arches. No new bridges were built until the Aqueduct was constructed to carry the Rolle canal across the valley in 1827 but this was quickly followed by Halfpenny Bridge connecting Weare Giffard with the new Turnpike road in the 1830s. (No prizes for guessing the amount of the toll charged for crossing the river). The coming of the railway in the 1870s entailed a further four bridges to carry it in a fairly straight line up the valley and, while the first of these, at Landcross, is a basic iron girder construction, the three near to Lord Rolle’s residence at Beam Mansion are made up of handsome stone built arches illustrating the power of the aristocracy to preserve the beauty of the landscape. 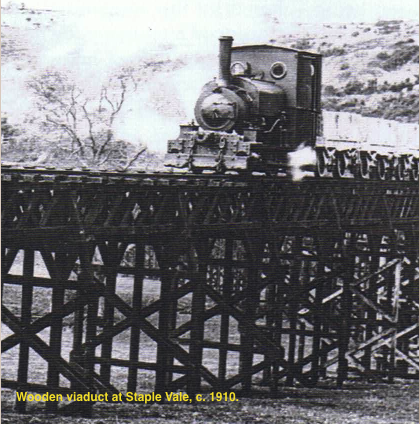 Rothern Bridge at Staple Vale, having stood alone for some five centuries, was now joined by a spectacular wooden viaduct to carry the Marland Light Railway across the valley, bringing in clay from the Peters Marland clay pits for transshipment to the main line railway to Bideford. This was in turn replaced by another iron girder viaduct similar to that at Landcross when the mineral line was upgraded to standard gauge and extended to Halwill Junction. The last new bridge was built in the mid 20th century, in between Rothern Bridge and the railway viaduct, to relieve the old turnpike bridge from all he fast and heavy traffic of the new, enlarged main road, the A386. This leaves Taddiport Bridge as the last of the original three pack horse bridges to remain of single track width and yet carrying a significant classified road linking Torrington with the country to the west. This entry was posted in Environment, History and tagged bideford, railway, river Torridge, Rolle Canal, Tarka Trail, Torridge bridges, Torrington. Bookmark the permalink.